Don't illegally dump large items by a garbage bin or on the street. There are free, legal ways for residents to get rid of unwanted items that don't fit in garbage bins, like furniture or appliances. Businesses and out-of-town visitors will be charged. 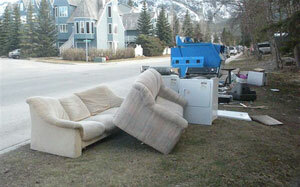 Drop off unwanted items and yard waste at the Town of Banff Operations Transfer Site at 160 Hawk Avenue, open seven days a week except public holidays, 7:30 a.m. - 3:30 p.m. (no loads accepted after 3:15 p.m.) Residential drop offs are free, but charges will apply to commercial and out-of-town drop offs. We'll pick up large items Monday through Friday. Call 403.762.1240 between 8 a.m. and 4 p.m., Monday to Friday to schedule a free curbside pickup of an unwanted item or yard waste. This service is only for residences and not commercial properties. Note that we do not accept renovation or construction waste. Pick up or drop off gently used household items at Banff's Re-Use It Centre, located at the Banff Transfer Site, 160 Hawk Avenue, seven days a week, 8 a.m. to 3 p.m. The Re-Use It Centre is closed on public holidays.